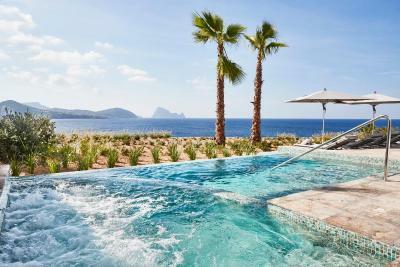 Lock in a great price for 7Pines Resort Ibiza – rated 9 by recent guests! 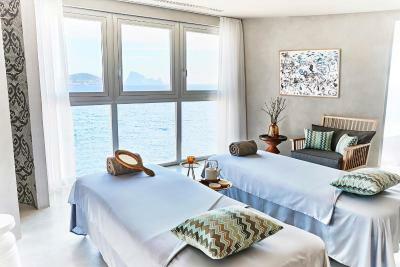 The location in terms of nature, relaxation and sunset views are unparalled. The food and drinks are expensive as you would expect at a 5 star resort. They manage to fit in a kitchen, mini living room and bedroom, so the space feels a little cramped and the rooms aren’t super special but they are modern, fresh and tasteful. You are paying for the location and 5 star service. The swimming pool is also next level. 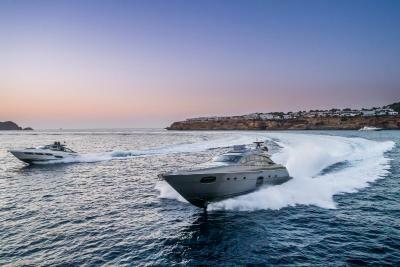 It exceeded our expectations, we were treated so well, staff are super efficient and we will definitely be back. The staff was extremely friendly. Especially the People who were responsible for the cars and the staff in the Restaurants. The area and the pool is very beatiful. The resort is beautiful, with possibly the best coastline on the island. We only spent a few days here for a weekend break but we're already planning our next visit. We would highly recommend it to anyone. Fantastic resort overall. Whilst it is still a work in progress, the facilities are excellent and I am certain within a year the resort will be even better. Staff are very polite and attentive. Great spot for a pre-drink to watch sunset. Special thanks to Simona Calo at the front desk who gave us some great recommendations and was very helpful. Great breakfast. Fantastic views. Wonderful restaurant. 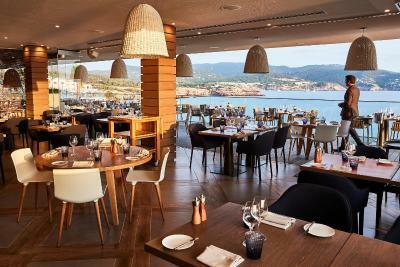 7Pines Resort Ibiza This rating is a reflection of how the property compares to the industry standard when it comes to price, facilities and services available. It's based on a self-evaluation by the property. Use this rating to help choose your stay! 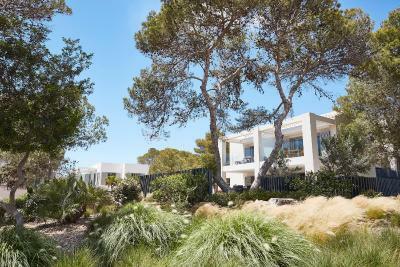 One of our top picks in San Jose.Located in Cala Tarida in the Ibiza Region, 11 mi from Ibiza Town, Seven Pines Resort Ibiza is surrounded by pine trees and features views of Es Vedrà Island, has a year-round outdoor pool and spa center. Each room at this resort is air conditioned and has a flat-screen TV with cable channels and a seating area for your convenience. 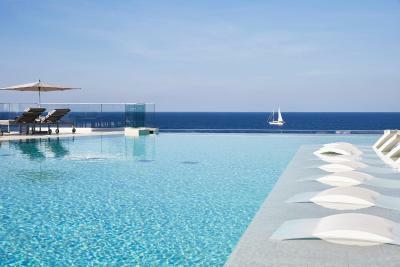 All suites feature a terrace or balcony, and some have a private pool. For your comfort, you will find bathrobes, slippers and free toiletries. 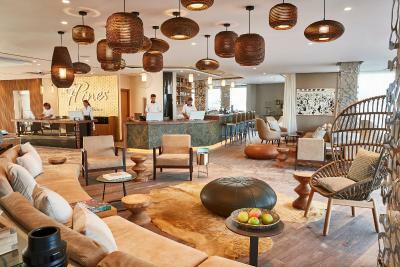 Guests can enjoy a meal at one of the 2 restaurants and 4 bars. 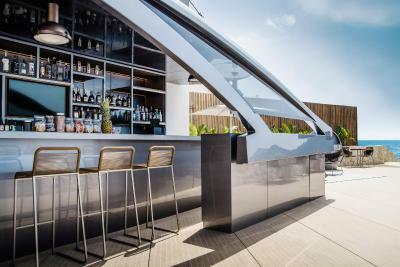 The View restaurant has an interactive kitchen concept, based on European cuisine using Asian cooking techniques. The Cone Club serves Mediterranean cuisine with Arab and Asian influences. 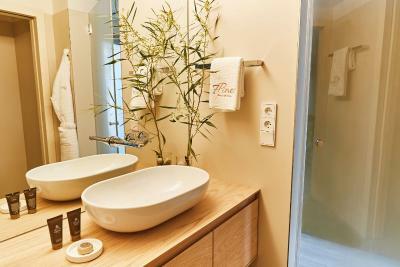 The resort has a 1.500 m2 area with two saunas, a steam bath, showers and waterbeds. 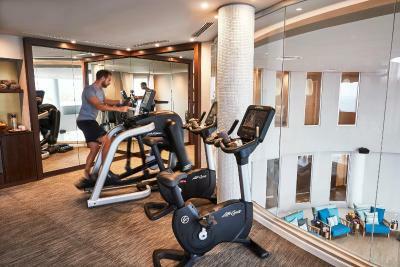 This resort has water sports facilities and bike hire is available. 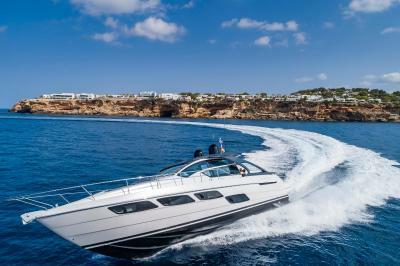 San Antonio is 4.3 mi from Seven Pines Resort Ibiza, while Playa d'en Bossa is 11 mi away. 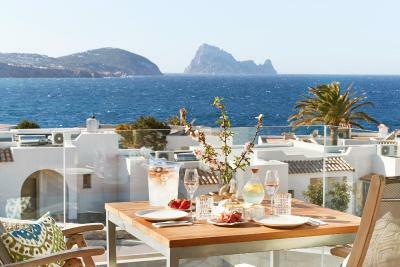 The nearest airport is Ibiza Airport, 14 mi from the property. 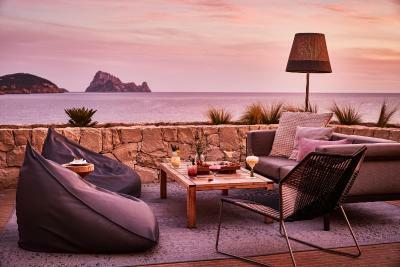 When would you like to stay at 7Pines Resort Ibiza? 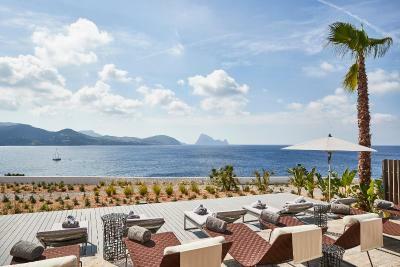 Spread around the first floor of The Laguna with breathtaking views of the sea and Es Vedrà, these suites provide a separate living area with a House Bar opening on a balcony, ideal to soak up the Ibizan atmosphere. 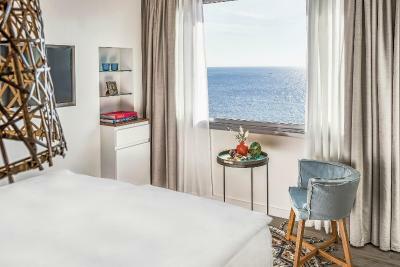 Spread around the first floor of The Laguna, these suites feature beautiful sea views to be enjoyed from a large balcony, an open living area with a House Bar and two bedrooms with private bathrooms. 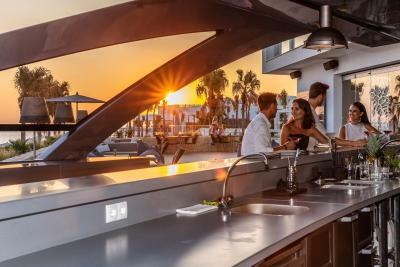 Located on the ground floor, these suites are spread around The Laguna and consist of a living area with a House Bar opening on a covered terrace and a separate bedroom with private bathroom. 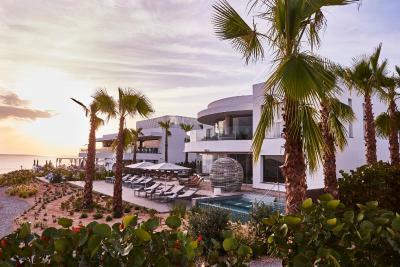 Located at the ground floor of The Laguna, these suites feature a living area with a House Bar opening on a terrace and garden, and two bedrooms with private bathrooms. 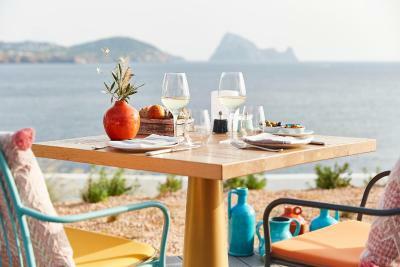 Located at the ground level of our traditional whitewashed houses and spread across the Ibizan Village, these suites offer a living space with a House Bar opening on a covered and furnished terrace surrounded by its own garden. bedrooms with private bathrooms and one guest bathroom, a large living area with a House Bar, seating space opening on a furnished terrace complemented by a lush garden and its own pool. Located at the ground level of our traditional whitewashed houses and spread across the Ibicenco Village, these suites offer a living space with a House Bar opening on a covered and furnished terrace surrounded by a garden and own pool. 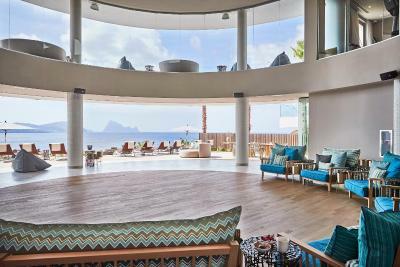 Located in a privileged area of the resort at the edge of the Ibicenco Village and right atop the cliff, these suites offer unparalleled panoramic sea views and cozy, Ibicenco infused living area with a House Bar, a furnished terrace and garden. 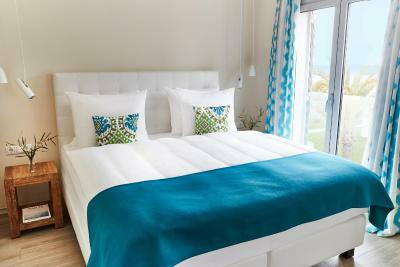 The first floor features two bedrooms including a master bedroom with a wide window opening to the sea, and one bathroom. 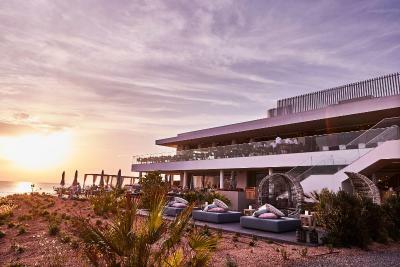 Located in a privileged area of the resort at the edge of the Ibicenco Village and right atop the cliff, these suites offer a spacious living area exuding Ibizan vibes, with spectacular sea views. 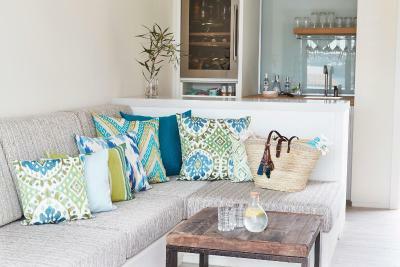 The two-leveled, open living area features a House Bar and dining table and a large seating area. Outside, a furnished terrace provides a summer living room while the first floor consists of two bedrooms and two bathrooms. Located on the first floor of our traditional whitewashed houses and spread across the Ibicenco Village, these suites offer a separate living area with a House Bar opening on a furnished balcony from where to enjoy resort and garden views. Located on the first floor of our traditional whitewashed houses and spread across the Ibicenco Village, these suites, ideal for families or longer stays, offer a larger living space with a House Bar opening on a living room and a furnished balcony from where to enjoy resort and garden views. 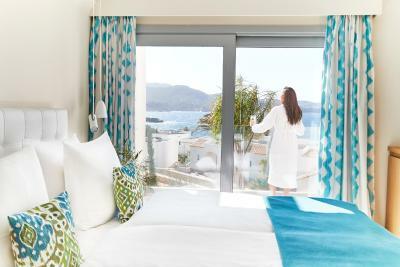 Located on the first floor of our traditional whitewashed houses and spread across the Ibicenco Village, these suites, ideal for families or longer stays, offer a larger living space with a House Bar opening on a living room and a furnished balcony complemented by views of the sea and Es Vedrà. Located at the ground level of our traditional whitewashed houses and spread across the Ibicenco Village, these suites, ideal for families or longer stays, offer a larger living space with a House Bar opening on a living room and a furnished terrace surrounded by a garden and own pool. Located at the ground level on the outward edge of The Laguna, these suites feature a covered terrace with own garden and access to a shared swim up pool. Inside, the open plan living area features a House Bar and a separate bedroom with private bathroom. 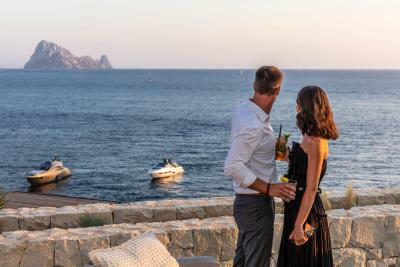 Located on the first floor of our traditional whitewashed houses and spread across the Ibicenco Village, these suites offer a House Bar overlooking a living room which opens on a furnished balcony from where to enjoy views of the sea and Es Vedrà. 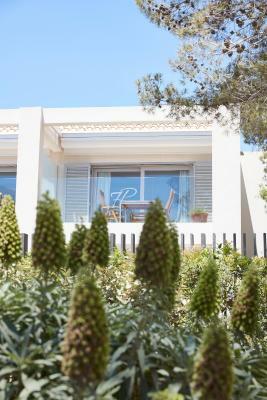 House Rules 7Pines Resort Ibiza takes special requests – add in the next step! 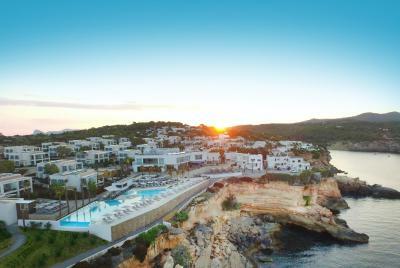 7Pines Resort Ibiza accepts these cards and reserves the right to temporarily hold an amount prior to arrival. The had a mix up with my room (got a smaller room than I paid for), only after few hours a proper room was made available to me. The view from the rooms are not great - that is different from what is being advertised by the hotel. It was a limited seaview but you were not in the first row and the view was above the roofs of many buildings. The staff was very polite and helpful but it is clear that the resort is new and they are still learning (for example we had villa not cleaned once or twice). For my taste the rooms were too small and the height of the rooms too low, also the room decor was nothing special for 5star hotel (felt like Ikea). Our private pool wasn't very private. Although we're sure that once the newly planted trees and shrubs grow, it'll be rectified. Only real gripe is that the bathrooms could be bigger (in comparison to the size of overall suites). Beautiful resort villa style. 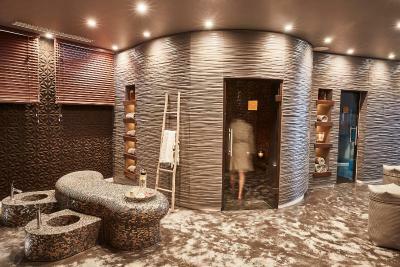 Friendly staff specially in the spa . Best part of the stay was the breakfast and the yoga classes in the morning with that amazing views to the sea.